Edinburgh city is at the center of Scotland’s rich history and is one of the most beautiful cities in the United Kingdom. In this article we will look at four historical sites that will give visitors a glimpse of the city’s history and culture. Edinburgh Castle. Photo via wikipedia by Kim Traynor. The castle is a UNESCO World Heritage Site and is the best starting point to learn about Scotland’s history. Located on a hill overlooking the city, the castle has been defending Edinburgh since the Iron Age. The Historic Environment Scotland website informs readers that the oldest building in the castle is St Margaret’s Chapel which was built in 1130. The castle has a huge array of historical artifacts from the Scottish crown jewels to the armories in the castle’s great hall. Holyroodhouse. Photo via wikipedia by Kim Traynor. The Palace of Holyroodhouse (referred to as Holyrood Palace) was built in the 16th century and is the official residence of the Monarch when in Scotland. Visitors to the Palace can explore the state apartments and learn about the building’s royal history. The ruins of the 12th century Holyrood Abby are also located in the Palace Grounds. Visit Scotland also adds that the Palace is home to the Queen’s Gallery, which has a program of changing exhibits from the Royal Collection. The museum may not look like much from the outside but within its walls is a thorough walk through of Edinburgh’s history. The museum has models that display how Edinburgh has developed over the years along with relics from the city’s past such as a display of old muskets used by the city watchmen. Undiscovered Scotland note that the museum has materials belonging to Field Marshal Douglas Haig whose name is well know in Britain for his role in World War 1. The museum has a model of the marshal viewing classified war maps and also his dress uniform and silver collection. Arthur’s Seat. Photo via Wikipedia by Kim Traynor. The final stop in a traveler’s journey to discover the history of Edinburgh is Arthur’s Seat. The hill is an extinct volcano and many legends surround it. The Scotsman reveals that there is no official reason to how the rock got its name however many rumors link it to the legendary British leader, King Arthur. For travelers, the rock offers panoramic views of Edinburgh and a chance to see the great city in all its glory. Edinburgh is an easy city to reach. There are direct buses, trains and flights from all of Britain’s major cities. 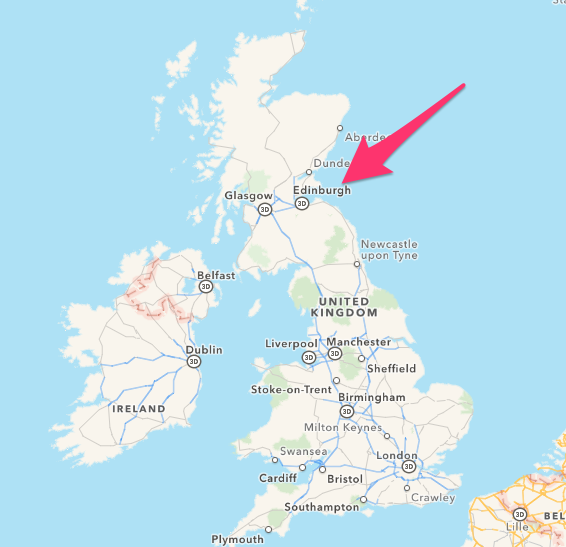 Travelers coming from abroad will most likely travel to Edinburgh from London. Visitors flying to Edinburgh will use one of London’s major airports such as Heathrow. This particular airport can be reached in 15 minutes from central London using the Heathrow Express. Alternatively for travelers driving to the airport, aviation parking specialists Parking4Less state that airports such as Heathrow offer short stay parking deals. These are ideal for those looking to return to London. If traveling by train from London the direct routes go from King’s Cross station (Harry Potter fans be sure to look out for Platform 3 ¾). The direct buses from London depart at Victoria Coach Station, which is located next to Victoria Train Station. For more information on a trip to Scotland click here.